Shine a Light: Careful Negotiation. Good Outcome. The sailors quite a few years ago. I've been married for 34 years ... over half my life ... to the same person. Sometimes - most of the time if I'm honest - this life's marriage-a-thon is good. The way it should be and I'm very happy and exceedingly grateful. Other times negotiating the mine field of differing wants/needs can be more than frustrating. Trying to achieve an acceptable outcome for both of us can expand into the realms of maddening, exasperating and downright infuriating. Usually its the BOAT that brings out the worst in us both. I'm a self confessed chicken sailor, happy to cruise through part of the day in light balmy winds. He's happiest when the wind is blowing hard and most of the sail is hoisted causing the boat to lean heavily to one side as it gallops through the ever increasing waves on into the dusk. You can just imagine the "negotiations" while at sea! This week has seen a (heated) rise in our land base "negotiations". His ankle is much better and we're both anxious to get 'Southern Belle' back down to Sydney where she belongs. I've made it clear I don't want to do the sail back .. for many reasons. He can't hear me. Even when I'm driven to raising my voice I can't get through. My husband just thinks I'll eventually give in - like I always do. Anyway we were down to threats. He was going to do it alone. All 900+ miles. And I was faced with the dilemma of holding my ground but worried if something awful happened I would never forgive myself for being "selfish". Why does it always have to be an all or nothing outcome? Well I can happily say we've reached a final compromise. And one that doesn't mean I have to give in. Hooray! 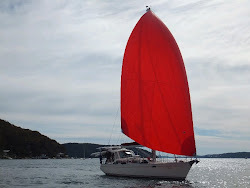 George will sail from Rosslyn Bay, where the boat is now, to Manly marina near Brisbane with one of our rally friends. I'll fly up and join him for a week or so while we visit friends there and then he'll sail the boat down to Sydney with other friends. Perfect. Good outcome. Can someone tell me how these negotiations could be easier. Is it possible? Or, is it just human nature - marriage or not - to have to wrangle with others before a compromise can be reached? I guess that's the case .. we still wage war and our politicians are getting more contrary. It's a damn shame it takes so long to just HEAR each other. And...I'm as guilty as anyone else. BUT deliriously happy I don't have to worry about his safety or sail the boat back! THANK YOU!!! and a Happy New Year! Use it .. or don't Lose It!